In about five minutes of email exchanges with colleagues, I/we went through something similar to the five stages of loss. No, wait, actually I just experienced the first stage, denial … I mean, does this make sense? As always, you know where to reach us. I don’t have a massive opinion to contribute. I just wanted to say your extension is the best one that I have ever installed. I wish so much there was one for Android available. Thanks for being so great. Thanks, glad you dig ABP! Have you tried Adblock Browser for Android? Been doing so for years … :) Or, more appropriately, we’ve been giving people the ability to block them. Adblock Plus is used by plenty of people around the globe. To say it is a wild success is an understatement. Chin up, be proud, you deserve it! Well, I disagree. But that’s fine. It’s your ABP, your screen … just turn it off. after buying a ticket, booking a flight and reserving a room, we got, ahem, dis-invited. and it informed us that our registration for the summit was canceled and our fee refunded. so… did IAB also compensate you for the cost of the wasted airplane tickets and hotel reservations? They BLOCKED you like unwanted elements from the event and why can’t they? They have every right to do so. I don’t understand much of all this do’s and don’t‘s with this uptight people but it’s common sense to me when an opinion is hold down it’s a train that will go wreck in the long run. After all it’s about the internet, a “free” place, not about china where one sided agreements are acceptable. BTW you guys are best, Best ad blocker. I love Piratebay because they live in there own way, in spite of all world authorities behind them, they are still up. I respect them a lot and I respect you too in same way. Never give up please!! You guys are helping Internet to be clean. Thanks! Really appreciate the support! The Edge extension will be out as soon as Microsoft allows extensions. No current plans for Windows phone unfortunately. I, too, cannot understand why you should be dis-invited. It doesn’t make sense, except that the strategies employed by advertisers on the internet also don’t make sense. From that observation, I suggest one can safely assume there is no rationale driving the industry and that lack of rationale is entirely reflected in the activities of the body which ostensibly oversees it. Also, thanks very much for what is the single most beneficial internet tool ever developed, and I should know. I’ve been an typical internet user since 1986 when, with my brand new 2400 baud modem, I dialed up my local library to see what my Dungeons and Dragons friend’s were referring to as MUD. Ahhh, those were the days. Then it all changed, the dark forces of The Commercial Imperative stormed the citadel. For a few years there, I thought the internet was gone, replaced with one big shopping mall. Tor helped a lot but, really, unless one is technically minded and also willing to stay on the steep, endless, learning curve required, there’s only so much fun to be had scooting around the back-doors and service alley ways of the mall. And then you came along. Whew! Thanks! It’s refreshing to hear this from someone who remembers when the Internet wasn’t about ads. 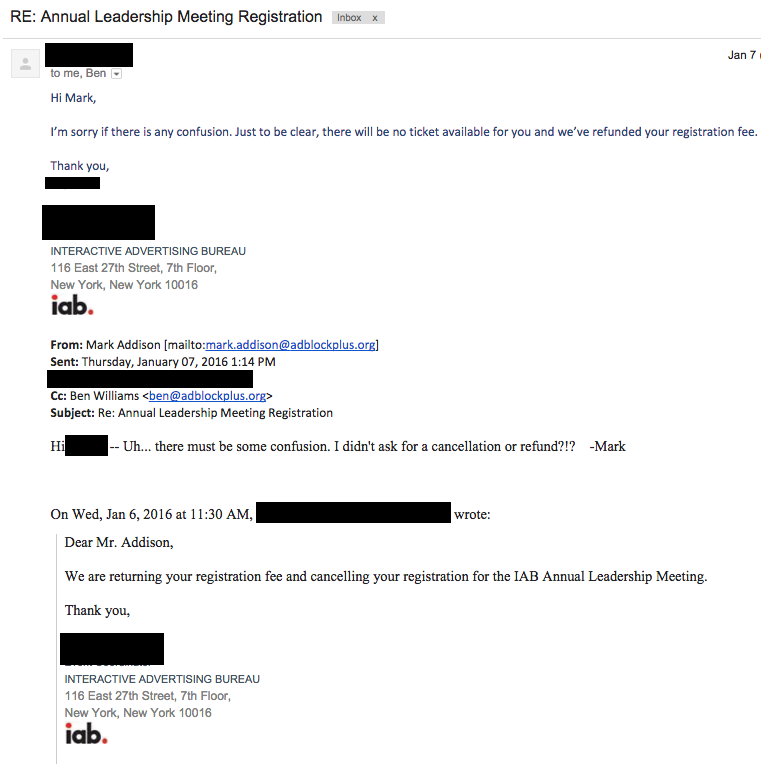 I guess it’s time to “uninvite” IAB members from the Acceptable Ad program. Nah, everyone’s welcome of course. It’s helpful to keep in mind that all members don’t likely share the militant, blunt stance that the top brass in the US IAB is taking. If this happens is because you are doing something right! Thanks for saving bandwidth on my cellphone. i will not allow them to tax my online experience just to support their outdated model of business. Get with the ages, if people want something… they we use the internet to find out all about that product. Here’s the new model of advertising: Companies make good products and provide all relevant information on their own website. Advertising happens through word of mouth by having a product that does what they say it will do and they have excellent support and information for current and potential customers to access. Not a bad idea at all, thanks for sharing. Your adblocker its the best, all of my clients have it installed and all are very happy. Awesome! Are you talking network-level installs of your clients? The reason is clear – your inclusion to the ‘EasyList’ (and other blocking lists) is pure corruption. Your ‘moderators’ who update the list are white-collar criminals; they add or remove URLs depending on ‘needs.’ Just like the corrupted DMOZ editors, your system got corrupted too. How can you allow a ‘moderator’ to make this important decision to edit the EasyList because some competitor reported his competitor on a forum? No wonder IAB considers you unprofessional and prone to abuse. Get your act together first and then think about getting involved with the professional advertising matters. Unless you do so, you will always be a corrupted outsider and wannabe of the online business. Thanks for the comment. Trying to piece it together … so you’re saying that because moderators for EasyList moderate, the system is corrupt? EasyList has always had moderators and contributors, it’s always been independent and it’s always worked this way. Not sure I see where you’re going here. Blocked ads = lost pub revenue = Joe Consumer pays for every piece of content they read. Is that really the point of it all? Just kill about 90% of all online banners? A valid point, but I don’t think the Internet can or should start erecting paywalls everywhere. However, there are other areas in which alternative monetization can be supplementary to better ads. IMHO that’d be a better Internet. But is not being acceptable by the IAB not a good thing? Adblock Plus should consider this an honor! Love what you do for us who use your product! It’s really interesting. I think they should explain why Adblock Plus can’t join this event. This behavior is rude. Yeah, it’s baffling as hell. Their explanations up to now btw, have all been drivel from their PR dept. What’ I’m saying is this. Let’s say some competitor reported that example-birds.com shows ads to users (that this ‘moderator’ deems ‘unacceptable.’). Then this competitor posts the URL on your forum to add it to the EasyList. The question is – why isn’t this moderator required to visit other sites, the competitors of example-birds.com, and possibly find ads to add to the EasyList too? Why is the ‘moderator’ only banning ads submitted by a shady competitor? If you don’t have KNOW-HOW how to scan all sites and automatically add ALL of the ones that ‘violate’ your acceptable ads terms, then do not create a corrupt system that only targets hand-picked websites. You should start clean and remove ALL sites from the EasyList, then create a tool / robot to scan sites and based on some FAIR criteria add or remove domains to the list. For now, this system is a joke that your ‘moderator’ targets random sites reported by competitors of these sites. EasyList is an independent project, and its main ad blocking list (used by most every ad blocker) adds ads based upon the work of hundreds of contributors, plus a few moderators. There are other lists of course. The whitelist is an exception list, which Adblock Plus maintains. For the first commenter, there is also an Adblock Plus app for Android that filters ads in other apps, but does not work as well as the Adblock Browser or the Adblock Plus browser extensions; for the one asking about Windows Phone, I don’t think it allows apps that do what ABP for Android can do (that is, local web proxies), and IE for Windows Phone doesn’t allow extensions (similar restrictions are why ABP did not exist for iOS until iOS 9 added a content-blocking API to Safari). Did he have a legal right to it, please? Maybe he is interested in this right was revoked. Don’t think it was a legal thing since he is judge, jury and executioner at the IAB. IMO, the problem is the “user” being not educated and informed enough about the true nature of the Web. Nowadays the Web is for the masses and then the “user” uses devices that act as “terminal” for “services” and then there is a fee. Which is pretty much the opposite of the true nature of the Web, that is about peer to pee connections. I am accessing a forum on ABP site but in the very same time I could host a forum on my side or any other service. There isn’t any predefined master-servant hierarchy here. Then, the issue with ABP is it works as a “install and forget” tool, instead of providing the means to filter contents but leaving the choice on the “user”. Doing so, ABP works with the same logic as the current “industry” about the “user” as a passive client with no understanding and options. The user either pays a fee or sees advertisement because everything is provided by some “authority” above. We all know on the Web the receiving side of any connection can do anything with the received content. It is the nature of the game, just that nobody says that. ABP makes it easy and obvious and AUTOMATIC. The idea of “acceptable ads” works in the current environment where people don’t chose in a direction or the other, so again, somebody else decide for them. It is about business models that are trying to co-exist, I don’t blame people from ABP because they make money but if it was just the “user” who decides, there would be no enforced ads because they would have been ineffective since the beginning and no need for acceptable ads either. Please read, then perhaps remove this comment, I couldn’t find an easier method for some sort of private feedback. I love the product, but do realize that some advertisements may well be the evil we must live with. However, I am a bit worried about what looks to be a fairly heavy handed tactic of “stop using ad blockers or pay up”. The most recent one that I am aware of is wired.com. I have an idea but perhaps more for your use in discussions with websites. The idea is perhaps to add an extra list to addblocker. The list might be some sort of gray list where instead of truely blocking the content, it is downloaded and then discarded. Individual sites could be added to this list and thus control that some of the naughty sites are treated in this manner. This obviously doesn’t do much for speedy downloads but it would open up the doors to all sites and would keep the pages cleaned of ads. The reason this is so controversial is that that one feature alone could kill online advertising. How could companies believe their ad campaigns with the knowledge that products exist that keep the numbers up but the number of eyes go down. Thanks, Chris. It does seem pretty heavy-handed, agreed, but it is of course their right to do so. It sounds like what you’re talking about is similar to element hiding. But for us the best solution is to reach ad block users on their own terms … which is the goal of Acceptable Ads. Keep up the good work. Advertisers must also realize that people are not just fed up with intrusive, shitloads of advertising. There have been numerous occasions where ad programs were actually installing malware on computers. Add to this the fact that people are truly becoming more annoyed by the fact that all their moves are tracked by the companies when they visit sites (social media sites liek Facebook in the frontlines). I don’t want companies to be able to see what I’m interested in and be all over me with directed ads or even know which sites I visit. I have several sites that I don’t mind (or let’s say that I can live with) using ads. Google ads in itself never bothered me that much since they are fairly unintrusive. But online newspapers? Boy they are terrible. I know they like to make a buck, but they need to find a balance where they still make money and their viewers are not pissed off by the ads. I’m sure you noticed, but Rothenberg responded to you on this topic, although perhaps not directly. Not that I necessarily agree with him. Just didn’t see any responses to this on this blog or in the comments. Thanks for the heads-up. He actually did call us out directly, but yeah, we were kinda done with it already.